Encourages the entire respiratory tract to gently cleanse itself. Assists the body in neutralizing allergens by nutritional means. Provides effective respiratory system support. Airborne particles are everywhere. When particles enter the respiratory system via the nose or the mouth, the body turns on its cleansing mechanisms, and the immune system is put on active duty. Herbal nourishment supports a healthy respiratory system that can be challenged by inhaled irritants. 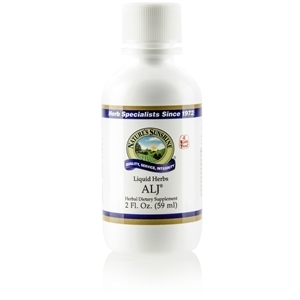 The herbal formula ALJ helps balance the natural eliminative functions of the respiratory system. It supports healthy lung function and helps support the body during seasonal changes. It also helps promote respiratory tissue health. Here’s how. Fenugreek and mullein contain mucilage, a substance that causes the herbs to swell in water. This creates a viscous, fibrous substance that provides a soothing effect. Fennel has traditionally been used as a cleansing herb and is often used after eating. Indians used boneset during seasonal times when the body needed extra nutritional support. Horseradish has a stimulating effect on the respiratory system, which you can easily discover for yourself by eating a small amount of the freshly grated herb. Take 20–30 drops (1–2 ml) with water every two–four hours; children take 10–20 drops (0.5–1 ml) with water every two–four hours.